Sculptor Ivor Abrahams is experimenting with integrating printed images with three dimension shapes. 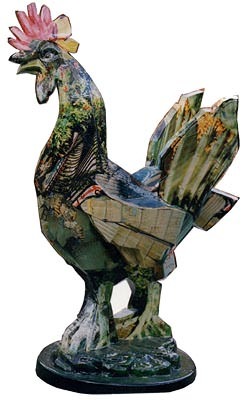 He has created a 2.5m high art piece entitled The Cockerel that uses prints from an Epson Stylus Pro 9500. Ivor worked closely with Derek Howarth of Devonshire based Sculpture & Constructional Design to create the 3D templates taken from the sculpture. Brad Faine of Coriander Studio London then adapted the templates on a PC to accommodate the transition from two to three dimension. The newly developed shapes were printed at Coriander using the Epson printer. They were then cut and applied to the surface of the sculpture with epoxy resin and surfaced with marine lacquer. The sculpture is currently being exhibited at the International Sculpture Exhibition, Carnival of Animals in the Hague, Holland until 11 September.